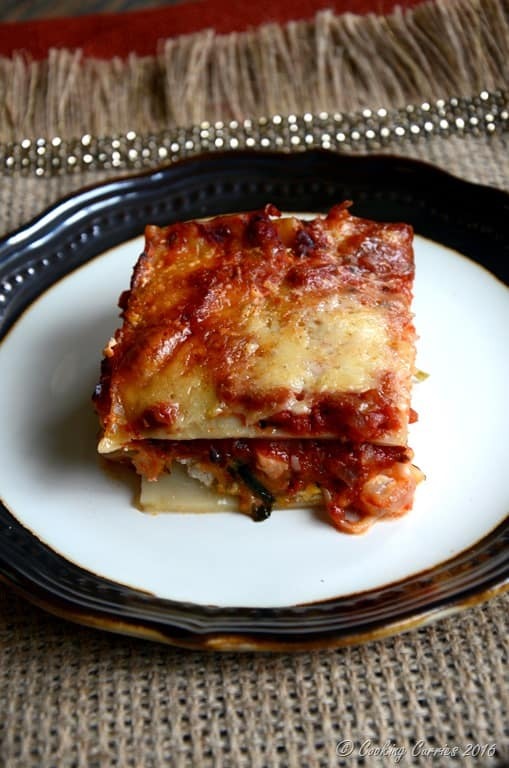 Seasonal Lasagna with Butternut Squash and Spinach, layered with marinara sauce to cut down the little bit of sweetness, will make an excellent vegetarian main for Thanksgiving. 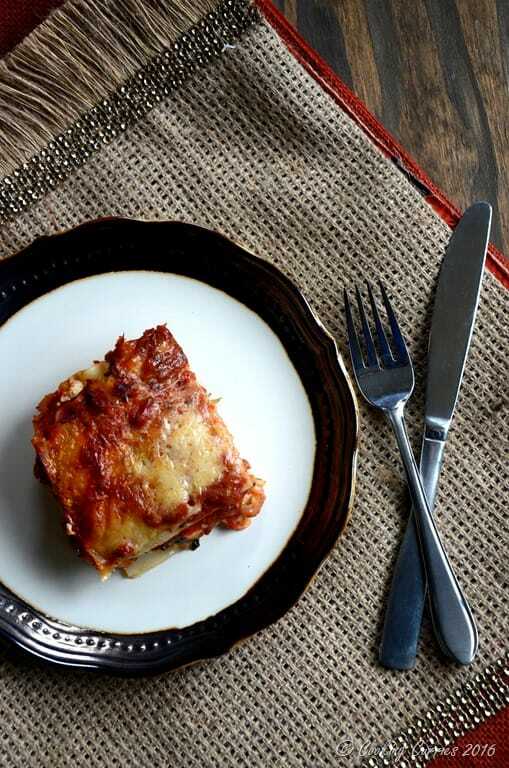 The first time I made a butternut squash lasagna, it was with a creamy white sauce and however delicious it was, it did not work well as a vegetarian main for me. It was a tad too sweet and uni- dimensional in taste that I could eat only very little of it. 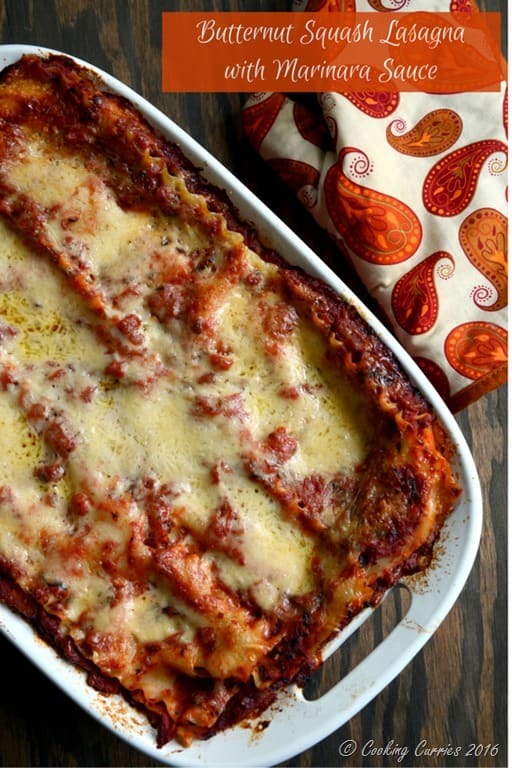 That is when I came across this recipe for a butternut squash lasagna with a marinara sauce. When I read it at first, I wasn’t sure how this could work. I however did try this one Thanksgiving and loved it! Cook the lasagna noodles as per package instructions. Drain and keep. Heat the oil in a heavy bottomed pan. Add the garlic and onions and saute well. Add the tomatoes, salt and pepper and simmer for about 30 mins or so. Cook the squash in the microwave with enough water to cover it fully, until it is soft. Drain the water and keep aside. Heat the oil and add the onions and garlic to it. Saute until onions are translucent. 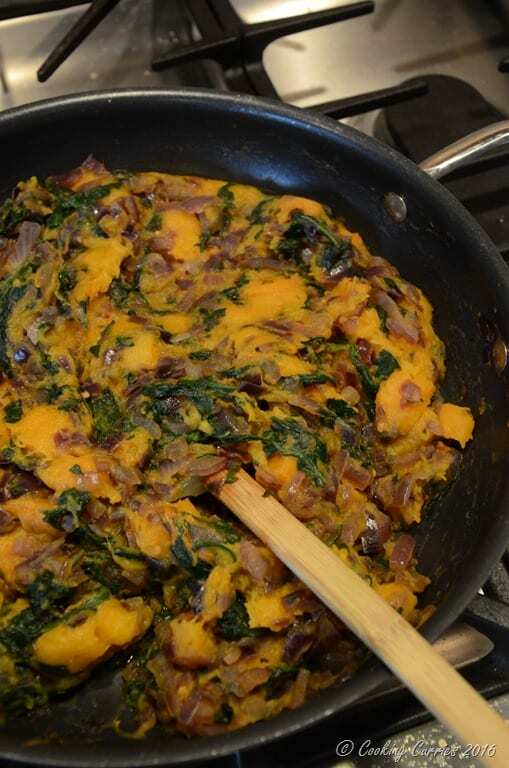 Add the spinach and once it wilts, add the cooked squash to it along with salt and pepper. Mix well Remove from heat and keep aside. Combine all the ingredients in a bowl and mix with a fork until well combined. In a lasagna pan, spray some cooking spray on all sides. 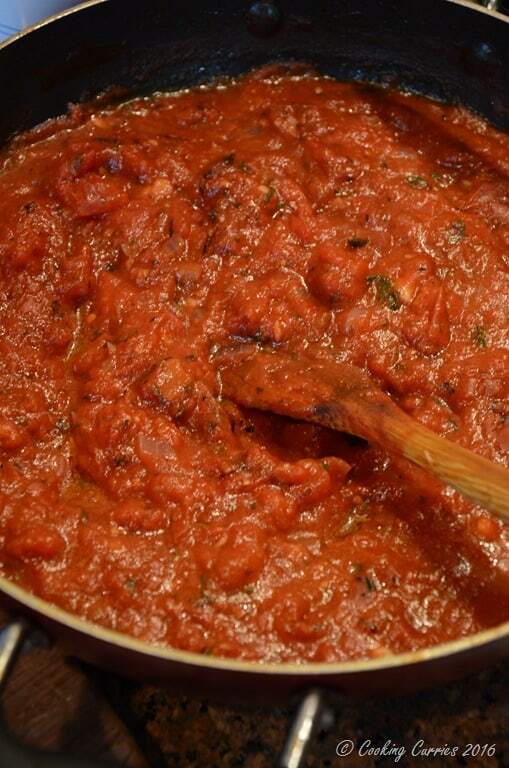 Spread 1/4 of the marinara sauce at the bottom. Spread a 1/2 of the squash mixture over it. Spread 1/2 of the cheese mixture over the squash mixture. Pour 1/4 of the marinara sauce over it and layer with three more lasagna sheets. Top with the remaining marinara sauce and the 1 cup of grated parmesan cheese. Preheat the oven to 375F. Bake covered with foil for about 30 mins or so. Remove foil and bake again for another 15 mins or so. The unbaked lasagna can be frozen. Thaw to room temperature before baking.